Dosa's are the most common breakfast item in our kitchen. I love making dosa's as most of the preparations can be made the previous day. This is one of our fav dosa. 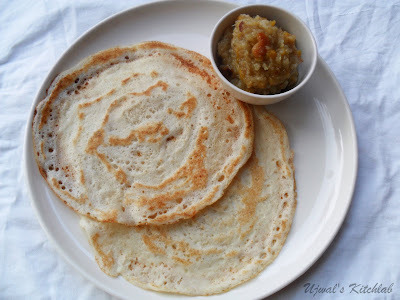 We normally serve this dosa with chutney but on makar sankranthi day we make it with sweet khichidi. These dosa's are generally made thicker than other dosa's and it is actually roasted on one side. But at my place we like it a little thin and roasted on both the sides. These are soft and fluffy dosas. Mushti PoLo uses measurement according to our fist size hence the name Mushti ( which means fist in Konkani) PoLo (Dosa in konkani). 1) Soak rice + dal + methi seeds for 4-6 hours. 2) Wash poha/puffed rice. Grind soaked rice + dal + poha/puffed rice. Let it ferment overnight. 3) Next day add sugar, salt and baking soda. Mix well. 4) Heat a griddle. Add 1/2 tsp oil. Spread the batter in circular motion. Let the dosa be a little thick. Cover and cook on medium flame until the dosa is cooked. You can flip the dosa and cook the other side if desired. Serve hot with chutney or khichidi. Delicious..such a tempting platter you have there.. Unique combination of dosa with khichdi, good step wise instructions, thanks. Mushti polo with Khichdi is something new..but I am sure it tasted delicious! !